Both The Rehearsal and its youthful author, Eleanor Catton, represent a phenomenon that I predict we are going to see even more of in the near future: a young writer who has roots in no particular country (but experiences from a number) and who focuses her or his fiction on some universals that can take place anywhere. Catton was 20 and a student at New Zealand’s Victoria University when she started writing this novel. Born in Canada, she was raised in New Zealand — the year after its publication there in 2008, she headed off to take her M.A. at the well-respected Iowa Writers’ Workshop. The Rehearsal has followed a similar kind of global voyage in the book prize world. It won the 2009 New Zealand first novel award. Last spring, following publication in the United Kingdom, it was longlisted for the 2010 Orange Prize. And last week it was shortlisted for Canada’s Amazon.ca First Novel Award. Ironically, on that list it joins Miguel Syjuco’s Ilustrado, another author/book combination with a similar travelling history (in that case, a Filipino author now living in Canada — and a book that won the 2008 Man Asian Literature Prize). If you are looking for other examples of the phenomenon I mentioned, consider Junot Diaz in the fiction world and Naomi Klein on the non-fiction side. So it is not surprising that The Rehearsal could be set anywhere. 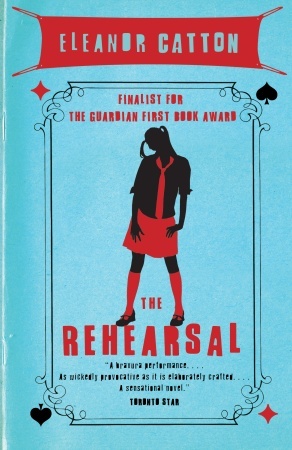 Its central theme is a coming-of-age story centred on not one, but a number, of mid-teens, all affected by a scandal that also could have (and has) taken place anywhere: an affair between a teacher and a student who has not yet reached the age of majority. That theme, incidentally, is not about the affair itself but rather the waves that it has produced in the community where it took place. Given that storyline and the youth of the author, perhaps the most impressive aspect of this first novel is the intricate structure which Catton has used to frame this book. While the affair is always present in the book, its implications are explored in alternating chapters from two very different points of view — one “real”, one “fictional” — which increasingly overlap and co-mingle as the novel moves on. That was at four. At five there is another knock. The saxophone teacher opens the door. She holds the door wide so Mrs Winter can settle in. It’s the same woman as before, just with a different costume — Winter not Henderson. Some other things are different too, because the woman is a professional and she has thought about the role for a long time. Mrs Winter smiles with only half her mouth, for example. Mrs Winter keeps nodding a few seconds too long. Mrs Winter inhales quietly through her teeth when she is thinking. They both politely pretend not to notice that it is the same woman as before. The saxophone teacher does not just imagine this role-playing with the mothers, she does it with her students. She imagines the dull and lumpish Bridget as wanting to play Victoria’s sister because that is a bigger role. And Isolde wanting to play Julia, the maybe-lesbian, a character that would simply be too complex for her. If that stream of the story imagines a drama imposed on reality, the setting of the alternating thread is a drama school, the Institute, where the acting world increasingly acquires aspects of reality. The central character here is another teenager, Stanley, who aspires (successfully) to be one of the 20 accepted from hundreds of applications and auditions to study at the Institute. Just as the dramatic aspects of the saxophone teacher’s view of her reality come to dominate that stream, a version of real events comes to loom larger in this “acting” thread of the story. The concluding — and most important — element for the first-year class is a production written, designed and performed by the class itself. They choose to do a dramatization of the affair between teacher and student, which in the community where the novel is set has become a centrepiece of conversation and rumor, again producing a mixture of what really did happen and what rumor says happened. The latter, of course, has become more accepted as fact than the former. For this reader, the strongest aspect of The Rehearsal was the painstaking way that Catton developed the merging of these two different worlds, one based on real events in the day-to-day world, the other a dramatized version that becomes increasingly real. We all impose imagination on completing the details of our picture of what really happened in any given situation — in this book the entire cast does the same thing. The notion of “rehearsal” and “cast” are very much present in both threads of the story. And by the time the novel comes to a close, both threads have roughly equal portions of fact and imagination. It is a significant achievement, as the novel’s success in prize competitions shows. I will admit, however, that for me the appreciation of what the author was achieving came to attract more attention than the story itself. Indeed, I am reflecting that in this review by concentrating more on structure and technique than on the characters themselves. Isolde, Julia and Stanley certainly have more depth to them as characters than this review reflects and I am sure other readers will find that. It may be a reflection of my own age and experience as a writer that the author’s finesse became more impressive than the novel itself. Despite that caveat, this is an exceptional first book. Catton has also had New Zealand success with some of her short stories. Given the reputation and record of the Iowa Writers’ Workshop — and the fact that all this published work preceded her attendance there and she is still in her mid-twenties — she is certainly an author to be watching in the future, as well as being appreciated now.